Republican Newton Leroy Gingrich has been involved in politics since the 1970s. Born in Harrisburg, Pennsylvania on June 17, 1943, Gingrich became enthralled with history early in life. Adhering to the adage that history repeats itself, Gingrich studied history in college. Gingrich attended Emory University and graduated with a degree in history and went on to Tulane University to earn a Master's and PhD in Modern European History. Gingrich then taught at West Georgia College Environmental Studies and History classes before leaving for a career in politics. Gingrich ran for office in 1978 and was elected to the House of Representatives for Georgia, where he served for twenty years. Four of those years, Gingrich was the Speaker of the House. While he was in Congress, the first balanced budget was passed in over twenty years and resulted in $400 billion of debt being repaid. Also, taxes were cut, and welfare was reformed to enable more than sixty percent of recipients to attend school or obtain employment. The military was also strengthened during his tenure in Congress. Although Gingrich left the political arena and pursued writing historical-fiction along with founding bipartisan organizations and joining several conservative think tanks. Gingrich's presidential platform consists of policies to help balance the budget, cut spending, increase jobs, implement an energy plan, reforming healthcare without Obamacare, and keeping America safe through more transparent national security measures. Although Newt Gingrich knows his birth father, he was adopted by his step-father, Robert Bruce Gingrich, when he was five years old. Newt's mother, Kathleen "Kit" Daugherty married Newton Searles McPherson as a teenager, and the marriage quickly fell apart after Newt was born. Newt himself has been married three times, which is slightly unusual in the political arena, and many politicians view marriage stability as almost a political requirement and makes marital issues fair game for the media to report on. Another interesting fact is that Newt's first marriage was to his high school geometry teacher, who was seven years older than him. This marriage produced two daughters and lasted nearly twenty years. Newt Gingrich has an extensive family tree that dates back to the 1600s when his ancestors came to America and settled in Pennsylvania. His family history includes members born in Switzerland, Germany and Scotland. Newt's daughters are both respected professionals. Kathleen Gingrich Lubbers, his oldest daughter, is the president of Gingrich Communications, while her younger sister, Jacqueline "Jackie" Sue Gingrich Cushman, is an author. Jackie married James Edward Cushing, Jr., and they have two children and live in Atlanta, where James owns and operates Cushman Material Handling. James Cushing, Sr. owns Cushman Corporation and is an important real estate developer who originated the idea of developing Atlanta's now popular mid-town area with the mixed use building Colony Square in the 1960s. At the time, the idea of a retail, hotel, business and residential building covering 12 acres at Peachtree and 14th Streets in Atlanta was considered bold. James Cushing, Jr.'s grandfather was Philip Alston, Jr., a well-known lawyer in Atlanta, who co-founded the Georgia Foundation and was President Jimmy Carter's Ambassador to Australia. The Georgia Foundation, under Philip Alston, raised millions of dollars for the University of Georgia. Philip helped Jimmy Carter get elected by chairing his 1976 Committee for Jimmy Carter. As Ambassador, Philip was involved in testifying to the Senate Banking Committee regarding the scandal surrounding an airline owned by Rupert Murdoch receiving a low-interest government loan. Philip served his country previously in World War II in the U.S. Navy. 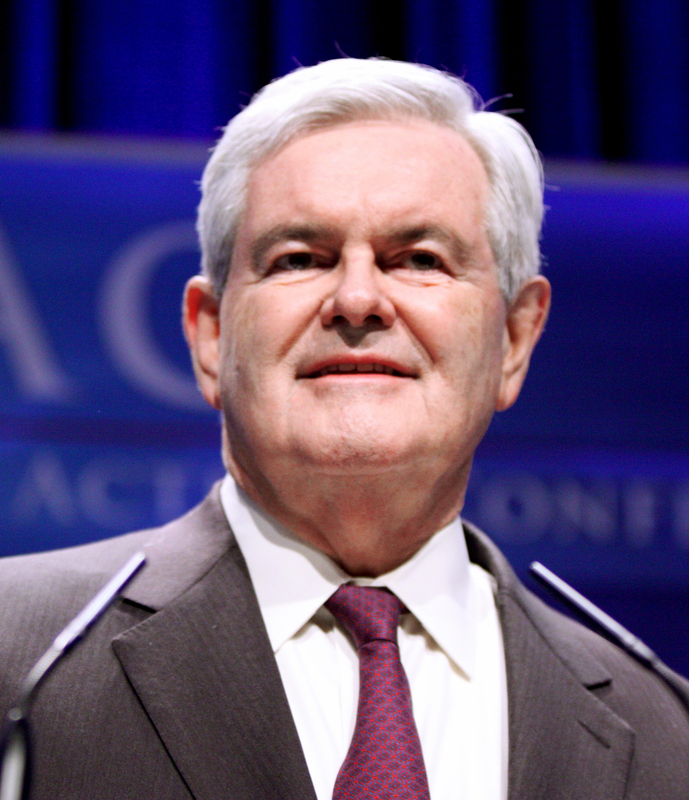 Newt grew up in a military household and experienced the horrors of both World Wars by witnessing the aftermath of battles while his adopted father, Robert Bruce Gingrich, was stationed abroad. Robert became a Lieutenant-Colonel in the U.S. Army and was a vet of the Korean War and the Vietnam War. Newt lived on the American military bases at Stuttgart, Germany, and in Orleans, France, before moving back to Fort Benning in Georgia to finish high school in 1960. Newt defeated his good friend for student body president and began further developing his love of politics. Newt's second marriage to Marianne Ginther was rocky. They were married in 1981, separated in 1987, got back together in 1994 and then divorced in 1999. Newt quickly married Callista Bisek in 2000, and their marriage appears to be solid. Newt's mother is quoted as describing her son as finally finding true love with Callista. Together, Newt and Callista formed a production company that produces documentary films on history and on public policy. Callista also does voice-overs for audio books and speaks for the American Solutions for Winning the Future, an organization focused on tri-partisanship. Callista is also an accomplished photographer, with photos being published by the Washington Post and The New York Times, along with being featured on the couple's websites.